For the past few months life has been somewhat hectic. Real work has been busy as we have been pushing to release our next generation product. In the meantime, I have been writing a book outside of work. The book, Treading on Python, is a quick paced introduction to Python. It has been an interesting experience, so I figured I would share a bit about it. Why would I create another book in the Python space? I have always liked teaching others. Possibly it is in my blood, my mom is a teacher, and I have found it fulfilling to help educate others. Since learning Python myself, I have been able to help many, including one on one with a teenager and, an old retired man, as well as classes and workshops with programming professionals, and elementary children learn Python. This book is aimed at professionals who want to be able to read and write Python quickly. I have been approached previously to write a book, and I did not feel like I could commit to a schedule while having full time work, and other obligations. But I was intrigued with writing a book. When I had to opportunity to give a three hour tutorial on Beginning Python that I had previously prepared, I decided to spend my preparation time (mornings and evenings) creating a book from the tutorial. More specifically, creating an ebook, where I controlled almost everything. Thus began the journey. 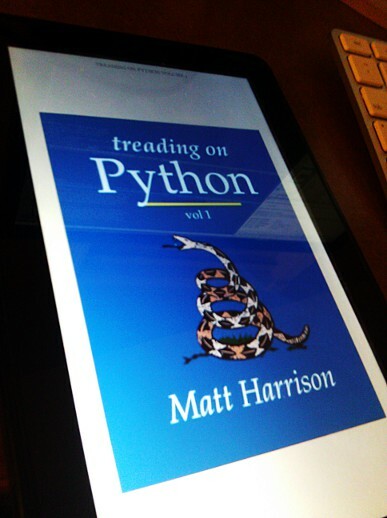 In the end though, I think I have the seeds of the Python book I would have wanted when I was learning Python. The book is currently available in draft form. With the help of my wonderful technical editor, JJ, I am in the process of reviewing and rewriting portions of the book. If you, or a co-worker, or friend, or family member are interested in the book, you can certainly purchase a copy. All purchases will get the updated final version when it is released. If you are inclined to help me with any of the above, I in turn would be inclined to get you a copy of the book. As I'm just starting my new blog (as well as migrating content over from the old blog), I need all the SEO juice, links, and help I can get. What is next? I plan on sharing my experiences. I have already started sharing some code on GitHub. I've made some attempts at marketing, and hope to make more. I figure that I should be open and share my successes and failures, so that others can learn. They should appear on this blog, intermingled with other somewhat related content. If you have requests or ideas, especially if you are working with ebooks, I would love to hear them. In the meantime, I have become somewhat obsessed with ebook creation. I have two other books I am currently working on that are related more directly to the ebook production process. I have also spent that last 8 Fridays teaching a group of ten 3rd-6th graders about ebook creation. Finally, I have submitted a PyCon talk about ebook creation using Python. So all of this is potential fodder for the blog. If you have and suggestions, questions, or comments please feel free to contact me. Cheers!